Hurricane season in the Atlantic usually runs from June 1st through November 30th, but for four consecutive years leading up to 2018, hurricanes formed before the season’s official start. The average hurricane season includes twelve named storms and six hurricanes-- three of which are a category 3 or higher. Like any natural event, a hurricane can either be no big deal, or homes and business can be gone in a flash. They’re unpredictable, dangerous, and potentially life altering. Think of some of the powerful hurricanes from the past few decades: Andrew, Fran, Ivan, Katrina, Sandy, and Florence--there was no amount of preparation that could have prevented the flooding and destruction of these storms. Many people have hurricane stories to tell. Even those who weren’t affected by high waters went without electricity for weeks. Some lost their entire homes or businesses. Others, sadly, even lost their lives. When a disaster is looming, residents take precautions with their homes. But what about businesses? It’s something no one wants to think about, but it’s an important question to ask: if a hurricane or other natural disaster hits, is your business prepared to weather the storm? If your warehouse is flooded and your stock and supplies are ruined, what then? Even if you can’t open your door, are you able to access your systems and pick up the pieces from a remote location? What do you do to avoid a disaster after disaster strikes? If your disaster recovery plan includes a backup server in another room, it’s time to upgrade. If you lack a recovery plan altogether, it’s time to get serious… and believe it or not, a serious recovery plan doesn’t have to include off-site, airtight, waterproof rooms, backup generators, or renting secondary data centers. There are cost-effective and reliable ways to save your business from a natural disaster even when your power is out for days or weeks at a time. Some business owners think they can’t afford a true hurricane disaster recovery plan because they think a true backup includes another physical location with a data center and staff to keep it running every day of the year. But Microsoft has pioneered and perfected the Hybrid data center; an extension of your on-premise systems into the popular Azure Cloud. Even if your power goes out as your last customer leaves your store, their order was backed up and logged before the power cut out. By integrating with Azure Cloud, your systems will be replicated with real time, up-to-the-minute updates. It will capture every credit card transaction, order, quote, and more that you were working on before disaster struck. 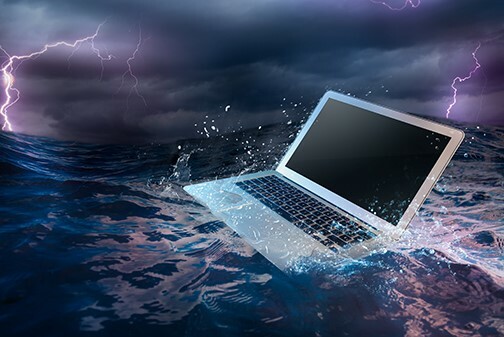 Having a secondary data center would force you to rent or own servers that you would hopefully never use, and only ever think about in the face of a disaster--not to mention the huge investment to do so. But with Azure, you only pay for the storage your solution consumes… and not a penny more. Your inexpensive Cloud solution lies dormant until you need it. Your sales data is one less thing you’ll have to worry about as the winds begin to pick up outside. Confidently weather the storm knowing that your business recovery plan is affordable and easily accessible in the Cloud. Learn more about ensuring your business continuity with Microsoft Azure when you download our disaster recovery guide, then contact the experts at AKA Enterprise solutions to get started with a reliable disaster recovery plan today. The next storm can hit at any moment… make sure you’re prepared! Which Came First…the ERP Software or the ERP Partner? Top 10 ERP Software Failures of 2011: Steps to NOT making the list! Introducing Social ERP: Is it Time to Bring Facebook into Your Enterprise? 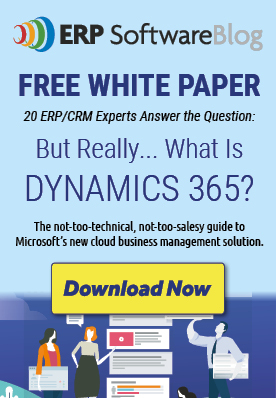 How is Your Organization Affected When Choosing Software as a Service (SaaS) for ERP?